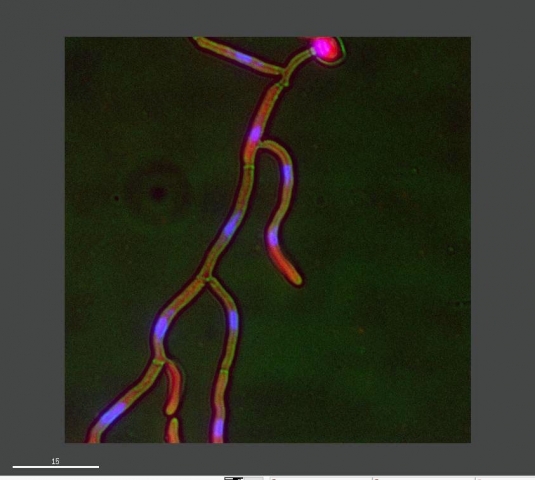 Dr Alexandra Brand FRSB, Research Fellow at the University of Aberdeen discusses her research into fungal cells with a built-in navigation system. As part of ‪Biology Week‬, the British Mycological Society‘s UK Fungus Day is hosting events across the UK and Ireland around 10th & 11th October. Fungi are microbes that permeate the world around us, re-cycling organic and inorganic materials to make new building blocks for life. They are experts at what they do and can degrade practically anything, which makes them both valued friends but also deadly foes. As friends, fungi provide nutrients for growing life and produce mankind’s most useful drugs (antibiotics, statins and immunosuppressants), but as foes they destroy a third of our world food crops and kill around 1.3 million people per year. Fungal diseases in humans are many and various. I work on a disease caused by the fungus, Candida albicans, which lives harmlessly as a yeast in the digestive tract of most people. In patients with a suppressed immune system though, the fungus can escape into the bloodstream and start forming thin penetrative filaments called hyphae. Although microscopic, hyphae penetrate into tissue to form fungal masses that are difficult for immune cells to attack. The ensuing battle between fungus and immune system is what causes the inflammation that can lead to death. As they invade, hyphae have to navigate and steer. I study how they do this, because mutant hyphae that cannot steer cause less cell death. Hyphae are pressurised, walled cells and build themselves from the inside without bursting – a bit like building a space station from the inside – but how do they know where to build so that they steer in the right direction? 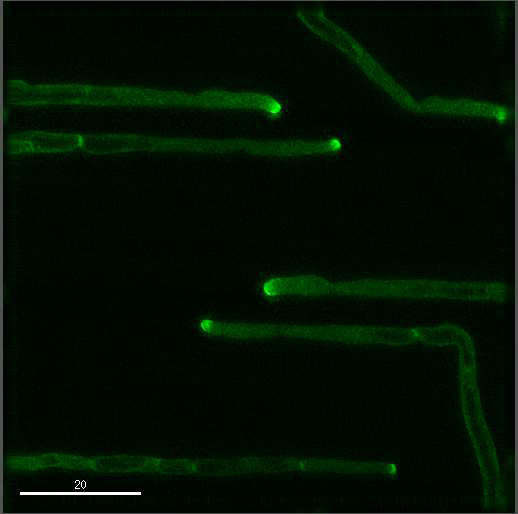 To find out, we challenge hyphae with an array of different-shaped obstacles for them to steer around inside tiny microfluidic chambers. By fluorescently-tagging intracellular proteins, we can see how they move dynamically within the cell in response to touch. Now that we know how normal hyphae respond to shapes, we are looking for gene mutations or drug treatments that make cells behave abnormally. Fungi share many genes with mammals. Some of the genes that help hyphae to steer also function in human cell systems, in which a sense of direction is crucial for development, such as neurons and new blood vessels. The study of cell biology in the humble but tenacious fungus may be steering us not only towards better treatments for fungal diseases, but to a better understanding of important developmental diseases in humans. 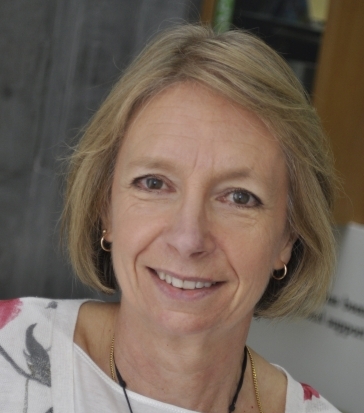 Dr Alexandra Brand FRSB, Royal Society University Research Fellow at the University of Aberdeen and Chair of the British Mycological Society’s Fungal Research Committee. Find out more about UK Fungus Day and Biology Week.